Hot chefs are setting the Seattle restaurant scene ablaze. With innovative ideas and culinary surprises, the city’s most heralded restaurants and eateries continue adding spark to an already sizzling food scene. From James Beard winners Holly Smith and Maria Hines to Chris Mills, who competed on the original Japanese Iron Chef in Tokyo, and restaurants like Volterra, which Rachael Ray named one of her “favorite restaurants in the world,” the Emerald City is filled with celebrity chefs, heralded restaurants, and Food Network star eateries that serve up delicious cuisine to locals and tourists. Seattle Chef’s Table is the first cookbook to gather Seattle’s best chefs and restaurants under one cover. Profiling signature “at home” recipes from almost fifty legendary dining establishments, the book is also a celebration of the growing sustainable food movement in the Pacific Northwest. 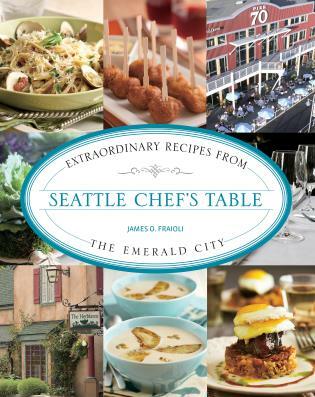 With full-color photos throughout highlighting fabulous dishes, famous chefs, and Seattle landmarks, it is the ideal ode to the city’s coveted food culture and atmosphere.